Blastrac France is reporting on a huge terrazzo polishing project in Paris where around 10,000m2 of terrazzo floor was polished. The terrazzo floor contained different colours in a hotel entrance and lobby. Three Blastrac BMG-780RS remotely controlled grinders where used to complete the job in a short time frame. Three Blastrac dust collectors, plus Blastrac pre-separators where used to ensure there was no dust exposure in this sensitive area. All metal and polishing steps where carried out with Blastrac Diamag grinding and polishing tools. 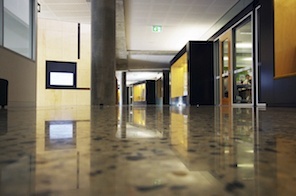 The flooring contractor Progrind in Australia has been involved in two projects utilising their grinding and polishing services. The supermarket Coles has taken its first step in what could be a whole new world in polished concrete. The supermarket giant considered using polished concrete in store for over two years before making the leap in December 2014 and enlisting Progrind to work on the new Coles shop in Coburg North, Victoria. The more than 3,200m2 project was completed in February 2015 prior to the store opening in August. As the first partly solar-powered Coles in Victoria, and built to a 4-star Green star standard and with an electric car charging facility, mechanically polished concrete was a good match for the store’s desired look and environmental objectives. MPC is not a coating or covering, which means less damage to the environment, lower costs, lower maintenance, greater durability and a longer lasting floor. “Both Becon Construction and Coles were very pleased with the floor so we are confident that there will be more and more polished concrete in the supermarkets’ future,” said van der Veen. Another project carried out by Progrind is the Yarra Valley Grammar School. An electrical fire destroyed the school, which planned to build bigger and better facilities. Enlisting Harris HMC as builder, and Hayball as architect, the school required 727m2 of decorative exposure high gloss concrete for their maths and science building. Progrind was the ideal choice for producing the desired finish and using MPC, achieved the high impact, hard wearing and abrasion resistant surface necessary for such a high traffic area. “Everyone is impressed with how the floor has come up,” said Harris HMC project manager, Christopher Curtain. Progrind delivered the required specifications in two stages of executing the bulk of the grinding and grouting early on, and then completing the grinding and polishing alongside the finishing trades. This meant less disruption to the building schedule and a reduced risk of other trades damaging the floor, resulting in the highest quality finish. “MPC is long lasting, hardwearing and incredibly low maintenance. Yarra Valley Grammar will have amazing looking floors for years to come,” said van der Veen. The manufacturer Janser in Germany has removed two existing floors with their ride on stripping machine. The 1,000m2 floor in a sports hall needed to be replaced. First step was to remove the old floor that contained a glued and insulated sports flooring. A 14mm sound insulation covering made of PUR rubber bonded granulated cork had been glued onto the screed surface. Additionally the sound insulation had been strengthened with webbing and glued with Neoprene contact glue. A final overlay of 3.2mm thick linoleum covered the floor, resulting in a total thickness of 18mm for removal. The interior decorating contractor hired to replace the floor had needed two processes to remove floor coverings of similar thickness. First the covering had to be cut into 250mm wide and 2m long strips with a plunge cut circular saw and then, during the second process, removed by an electric stripper. This was a cumbersome process. With the Jansen ADB ride on stripper everything worked much smoother. The ride on stripper weighs 1,050 kg and has a stripping capacity of up to 37m/min. The battery on the stripper guaranteed continuous working during 8h to 12h. After 8h of recharging, the battery of the machine can be in use for a further 12h. The sports flooring had been cut into a suitable pattern with a self-scoring blade of 155mm. Then the flooring could be removed easily using a standard blade of 685mm width. The flooring could be removed without leaving any residues, which meant the surface only had to be sanded in preparation for the new flooring. Thanks to the Janser ride on stripper working with blades of up to 685mm width it achieved an average stripping performance of approximately 240m2/h. After about five hours 1,000m2 sports flooring had been entirely removed. During the second half of the first working day the surface was sanded and vacuumed. Previously, two entire working days had to be set aside only for the removal of the floor covering. An Indonesian contractor has used a Chinese Xingyi burnisher on a large grinding and polishing project in the Fuijan province. The contractor has worked for many years grinding and polishing of concrete floors and claims to grind concrete floors in four stages and finishing with a Xingyi burnisher in only one step to produce a very shiny surface. The customer was very impressed with the efficiency of the Xingyi burnisher and said that one operator working 8h managed to finish 500m2. The successful job lead to two larger project, a 25,400m2 in a packing area and 25,000m2 at a sport shoe manufacture.